FULL DISCLOSURE: I was given the book for free with the understanding I would provide an honest review. 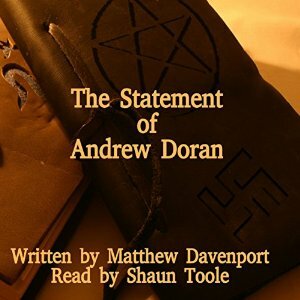 THE STATEMENT OF ANDREW DORAN by Matthew Davenport is a Lovecraftian horror novel set during World War II. We get an array of monsters, zombies, and Nazi’s (oh my!). Clocking in at six hours STATEMENT had a good pulp serial feel to it. We have some action and it always felt like Professor Doran was in the right place at the right time in order to find himself in a bit of a pickle. Being Lovecraftian in nature I was ready for some flat out insanity and wasn’t disappointed. Grim and gruesome, fun was had by all. I co nfess I found myself lost in the plot more than once. The quick pace of the storyline means you can’t read or listen with your mind on your dinner. The crux of the story is Professor Doran’s chasing a copy of the Necronomicon, which is a magical book of great power. Along the way Doran is joined by French femme fatale Olivia and her French Resistance cohort with the aim of getting into German occupied France and ultimately recovering the Necronomicon from the Nazi’s. I liked the character of Doran. He reminded me of a mashup of Indiana Jones, Clive Cussler’s Dirk Pitt, and the indomitable Robert E. Parker’s Spenser which is a series I adore. In the Lovecraft works I have read, which is not complete, often the main character is fainting or otherwise succumbing to the surrounding insanity whereas Doran keeps his feet and moves ever on. Doran’s a man’s man and that is a good thing in this story’s setting. I must say most other characters seem a bit flat and undeveloped however in a short serial perhaps this will be rectified in future installments so I forgive it here. Davenport’s prose is sparing and workmanlike. Being a shorter piece there isn’t much world building and I suppose that can be expected and forgiveable as today’s readers are likely well acquainted with the WWII setting from the great quantity of other media on the subjet. The action is well written and we get some nice ghastly sights to take in. I must say that the audiobook narration by Shaun Toole was not without issue. Toole’s passive observer narration was quite good however his character voice work felt like it could use some work. His female voices were particularly jarring and foreign accent’s sounded off to my ear. With some work on those areas I think he could have a great future in narration. With good action, creepy settings, and a main character with some guts I enjoyed my time with Professor Andrew Doran and would gladly pickup a sequel. This entry was posted in Audiobook Review, Book Review, Genres, Lovecraftian Horror and tagged Audiobook Review by admin. Bookmark the permalink.